Her work has been shown in Italy, Hungary, the UK and Jersey. Described as a colourist-expressionist, Jane is a spontaneous artist who works intuitively. The main body of her work is informed and inspired by form and colour, either in architecture or the landscape. Much of Jane's work is produced for charity. 2011, 10.5 x 15 cm, ink on watercolour paper. Siena Art Institute. DON'T MISS my exhibition in The Friends' Gallery (Long Gallery) at the RWA in Bristol - on until Thursday next week (15th Aug). In aid of the RWA, 50% of any sales will also be shared equally between the charities which I support: World Land Trust, Sea Shepherd, The Shark Trust, Sea Mammal Research Centre, Weston Hospicecare, Grampian Hospitals Arts Trust, Edinburgh Sick Kids, The Brooke Pakistan, & The Mayhew. This small portrait, featured in my RWA exhibition until 15th August (see news above), is of a lovely rare-breed Cotswold sheep on Adam Henson's farm in the Cotswolds. Adam has been instrumental in saving this once endangered breed, and many other livestock breeds. Visit the farm to enjoy these animals at close quarters: www.cotswoldfarmpark.co.uk. 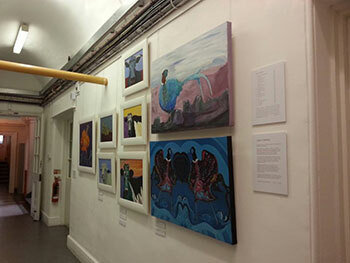 I have been selected to mount a solo exhibition in the Long Gallery at the Royal West of England Academy in Bristol. 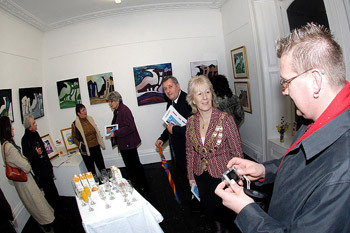 Showing a selection of studio work from 2006 until now, including The Weston-super-Mare Series, Pheasant Series, Wadham Beach Series and animal paintings, it opens on 6 July 2013 and runs until 15 August 2013. The work will be sold to benefit the charities I support: World Land Trust, Sea Shepherd, The Shark Trust, Sea Mammal Research Centre, Weston Hospicecare, Grampian Hospitals Arts Trust, Edinburgh Sick Kids, The Brooke Pakistan, & The Mayhew. This print, and Christmas Pheasant, selected for the 2012 Christmas show (Autumn Exhibition) at R E Bucheli Fine Art in Bristol. After a very long gap, I have recently returned to life drawing. Here are two works from recent classes with Bristol Drawing School which are held in the main gallery of the RWA - a lovely inspiring spacious venue. A new website which will combine both the art and music elements of my activities is currently being created and will replace my 4 original websites including this one. Inevitably some original content from the other sites will be off-line during this process. My apologies if you are unable to find the information you hoped to find - please do get in touch via the contact page on this site with any questions. My paintings Blue Coat has been selected for the North Somerset Arts Showcase Exhibition in the stunning new Arts Centre at Sidcot School, Winscombe in September. The painting will be sold in aid of charity and will benefit Weston Hospicecare and Grampian Hospital Arts Trust. This new painting from my studio has been created for a charity event in Edinburgh. More details forthcoming. Several of my paintings and prints are to be sold to benefit a range of charities which I support. Visit the Jane Cartney Art Studio & Gallery page on Facebook (link at top of News) for more details. [image attached]. This example, Boulevard en Mai, is to be sold to benefit The Shark Trust www.sharktrust.org, who will receive 80% of the purchase price. I have been selected to show works both in Florence and Rome. In 2009 I was invited to show three of my paintings in the World Wide View Exhibition at the Opera Gallery in the heart of Hungary's capital city - the first time my work was shown in continental Europe. Quizzical Cow oil on canvas board, and Lewis goes to Edinburgh pen and ink, were created specially to raise funds at the Event exhibition and sale at Lyon and Turnbull in Edinburgh,Scotland in November 2010. I accept private portrait commissions. If you are considering commissioning a portrait, please contact me to arrange a confidential consultation. Portrait of Richard Glover, 2008-9, oil on canvas, 50 x 40 cm. I have supported a number of charities in the UK and the USA in recent years by creating special work and donating paintings, prints and cards fto raise funds for special causes. Jane Cartney - Debut & Retrospective is on view through May 13 at Venue 99 - North Somerset Arts Week 2007. Contemporary Scottish colourist-expressionist - professional painter and printmaker, art historian. Formative training in Aberdeen, main centres of study, Amsterdam, Ghent, Paris, Edinburgh, London, Brighton... Life Study - Seated Female Front (Kate in Wandsworth), pencil life study, 1984. A selection of early self portrait sketches. - A representational showing of the series since the first Beach Road painting in 2006.